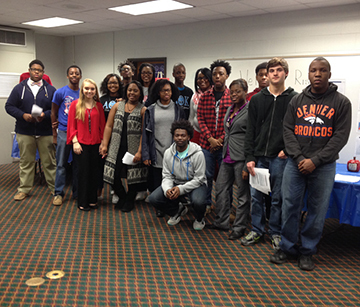 Merriwether and JET eighth graders toured Strom Thurmond High School (STHS) and Strom Thurmond Career and Technology Center (STCTC) on Friday, January 22, 2016. “We put in a tremendous amount of time and energy to make sure it is a great experience for the students,” explained Libba Ingram, STHS teacher and tour organizer. “Our schools have so much to offer and we want the students to be excited about coming to Thurmond,” continued Ingram. The eighth graders’ tour guides were STHS and STCTC students. “We are so proud of the job our students did presenting our programs,” said Jennifer Lanham, STHS secretary and tour organizer. “Our students developed leadership skills they will use all their lives,” bragged Lanham. 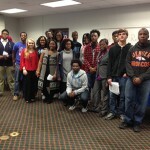 Information about all of STHS and STCTC’s programs was presented by STHS and STCCT students. The eighth graders were divided into small groups to give them an opportunity to ask questions. The tour was capped with a pep rally and performances by the STHS Fine Arts department’s Jazz Band and Show Choir.